an Adventure on Lake of the Woods, Ontario, Canada. 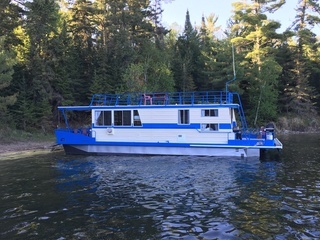 If you're looking for a unique alternative to other vacations, chart a course for Tomahawk and shove off on your own Floating Cottage and explore Lake of the Woods. Get away from it all in style. 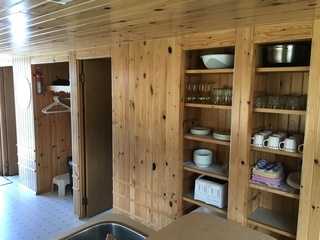 Our 50-foot houseboats are kept in like-new condition and feature all the comfort of home-including a 3-piece bath, hot and cold water, a propane furnace, and fully-equipped kitchen with a microwave, coffee maker, and toaster! A Tomahawk houseboat takes the "wild" out of a wilderness vacation. You can travel to secluded beaches, wake up right next to the best fishing spots, or just navigate the lake and soak up the scenery. It's your chance to really "get away from it all". 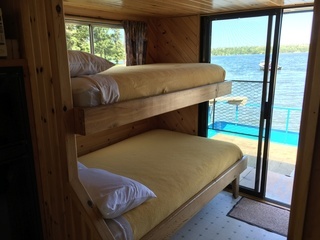 A houseboat vacation is a great way for the guys to stay close to the fishing action, or a relaxing getaway for two to three couples, families or older children who would like to take their parents on a truly memorable vacation. It's like a outpost trip, yet close to conveniences with all the comforts of home. Our well-maintained equipment and attention to service means you're free to enjoy the stunning beauty of Lake of the Woods. Your can travel to pristine beaches and enjoy a swim in the crystal clear water, or cruise to the best fishing spots and wake up every morning right next to the action. 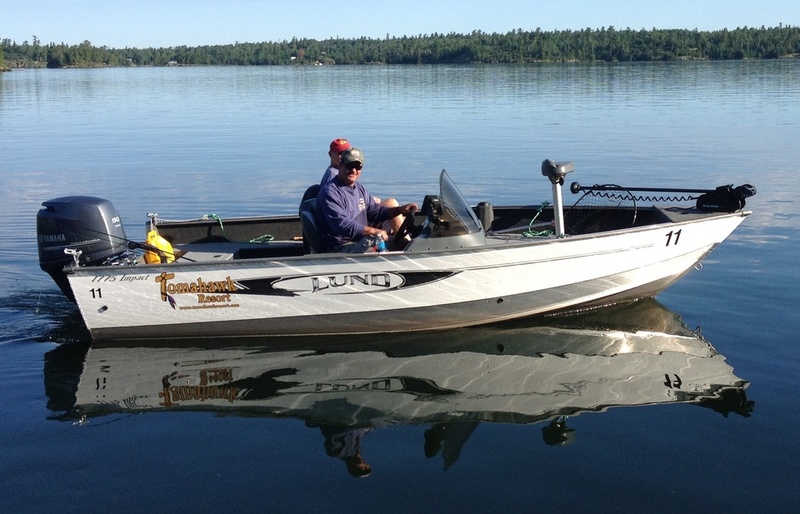 Lake of the Woods has provided world famous fishing excitement for decades. You can test your angling skill on Walleye, Pike, Bass, Muskie, Lake Trout and Crappie. Your won't waste a minute running to your favorite hotspot, you'll wake up there. Fish from sun up to sun down. You can even fish right off your back porch! 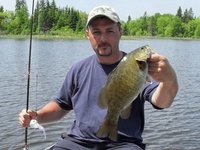 If you love fishing, a houseboat vacation puts you right in the middle of the action. Nothing is more important to a great fishing trip than the right equipment. 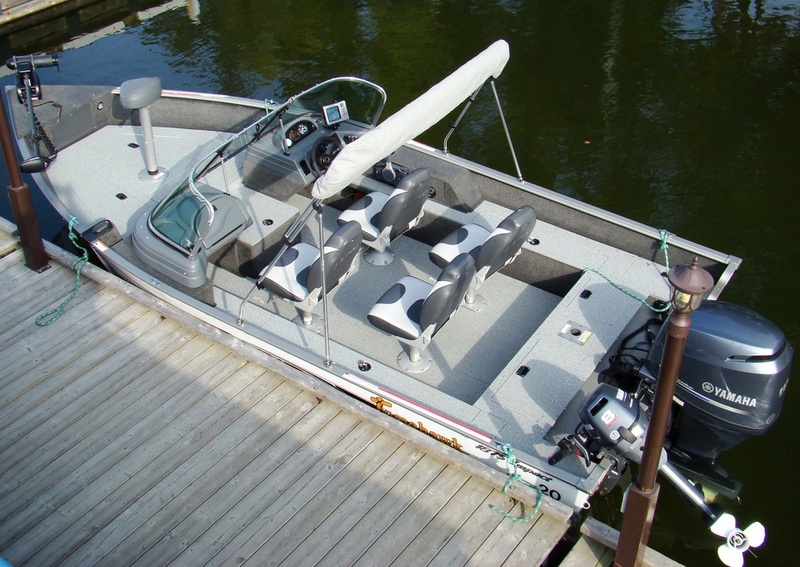 A new Lund fishing boat (17 foot, 18 foot, or 19 foot) with Yamaha motor (50 hp or 115 hp) is provided with all our houseboat packages. If you like you can bring your own fishing rig and tow it behind. 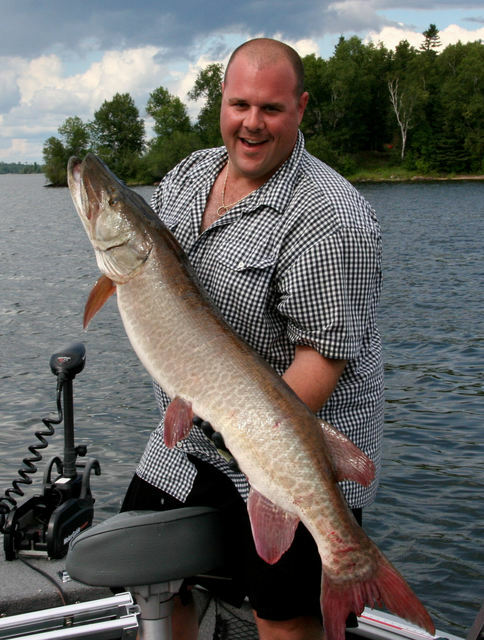 Either way, you'll enjoy the natural abundance that Lake of the Woods has to offer. 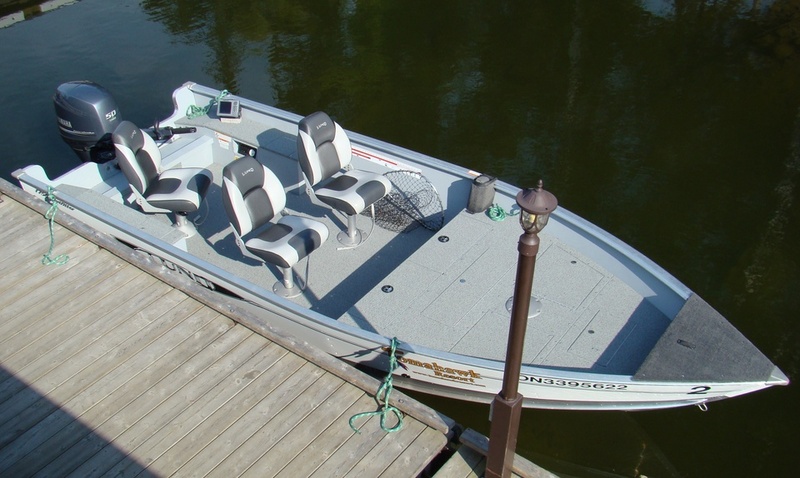 Our fully equipped fishing rigs are powered by Yamaha four-stroke motors, purchased new every year, and come with colour sonars with GPS, live wells, and lifejackets. 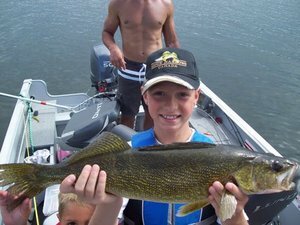 Of course there are all sorts of outdoor activities like water-skiing, tubing, snorkeling, hiking, berry picking, watching the wildlife, exploring, and photography, to name just a few that you could squeeze in between fishing trips. You'll never run out of things to do on a Tomahawk Houseboat Vacation. Even if all you do is relax! Lake of the Woods is truly a natural wonder, has coverage of approximately 1485 square miles with more than 14,500 islands and 65,000 miles of shoreline. You're never far from land! A short cruise with one of our staff gets you off in the right direction, with all you need to know about navigation and piloting your floating home. Any questions, and simply pick up the radio and talk to the resort. Mid-week during your cruising vacation, we will come and visit you to bring out ice, fresh towels & linens, gas, bait, or any grocery items you might require. 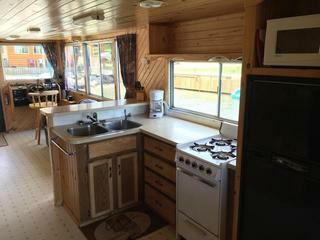 Tomahawk houseboats are like your home away from home. 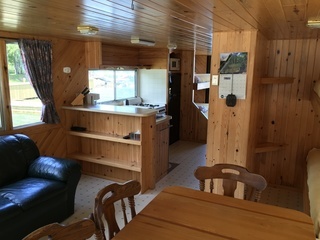 The interiors are bright and airy, finished in impressive tongue and groove knotty pine. There's a large living/dining area, a fully equipped kitchen, three piece bath and huge top sun deck. You'll never feel crowded, even though there is room to sleep as many as eight people. Large screened windows surround the boat and glass sliding doors open on to the front and rear deck. On the back deck, you'll find a gas barbecue for creating meals with a genuine northern flavour. The beds are solid and feature excellent quality mattresses for a restful night's sleep. There are no camp cots on a Tomahawk Houseboat. Your won't believe the comfort and convenience of your floating vacation. It is standard practice to pay for your trip in full prior to your arrival or at the time of check-in. We accept Visa, Mastercard, Discover, travellers cheques, certified cheques, and cash. Your reservation deposit will be held until check-out time. Your are responsible for damage to the houseboat, however caused, and any bodily injury which may occur; however, our insurance limits your financial responsibility to $1500.00. A credit card is required upon check-in. Your reservation deposit of $700.00 is applied against any damages incurred on the houseboat, or injuries, should circumstances warrant it. Deposits are refundable, less a 25% service charge, only when the cancellation is made no less than 60 days prior to the scheduled check-in date. If the deposit is made within the 60 days of the scheduled check-in date, the deposit is then non-refundable. You may board your houseboat at any time after 2:00 PM (earlier if the boat is ready), on the date of check-in. You must return the boat to our dock before 9:00 AM on your check-out day. For safety reasons, it is mandatory to have a small boat to tow behind the houseboat. 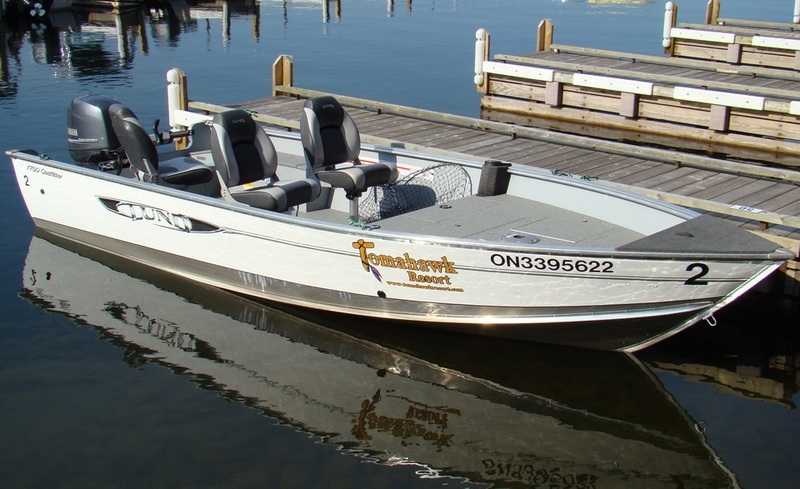 A small round bottom boat with a 15 hp is included (excludes the Houseboat fishing packages) or you may bring one or more of your own personal boats to tow behind. You will only pay for the gas you use on your trip. Tanks are filled prior to departure and refilled on your return. Our Houseboat Packages include all fuel for the houseboat and rental boats. First time houseboating? Don't worry, we can accompany you on the first few miles of your trip, to familiarize you with the operation of the houseboat and with reading the navigational charts. A ship-to- shore marine band radio is on board and there is cell service throughout most of the lake should you need to contact the resort during your trip. 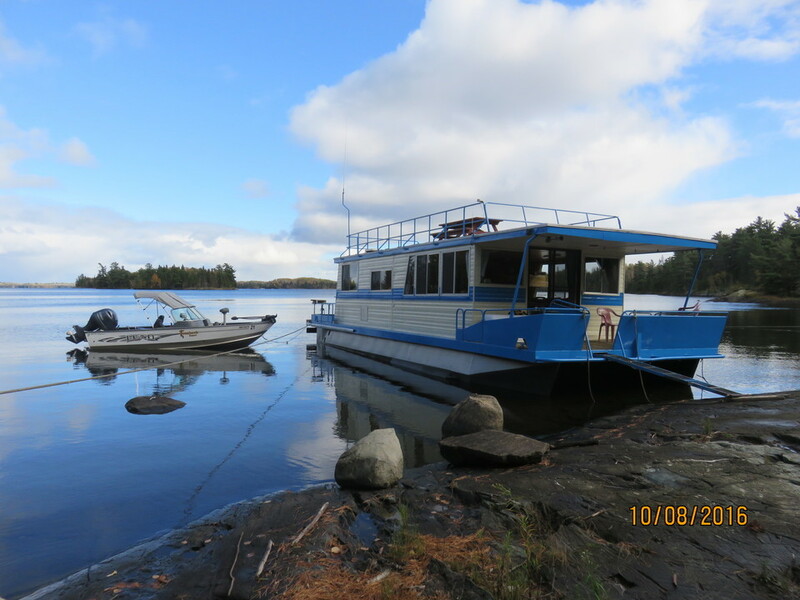 Includes Houseboat accommodation for seven nights, new 17', 18' or 19' Lund fishing boats equipped with Yamaha motors, all fuel, and ice (12 bags). Children age 10 and under cruise FREE (with a minimum of 4 paying people). 2 17' & 50 h.p. $1470.00 18' & 115 h.p. $1735.00 19' & 115 h.p. 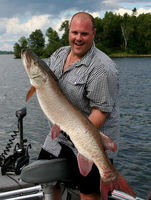 3, 4, and 5 day houseboat fishing packages also available. Please give us a call to have a package custom tailored just for you! For a description of the 17' & 50 h.p. , 18'& 115 h.p. or 19' & 115 h.p. boats and motors, please see Marina Services section for more details. All fuel consumed is paid for at completion of trip. Tanks are full upon departure and re-filled upon arrival. Propane, generator, and towels/linens included. 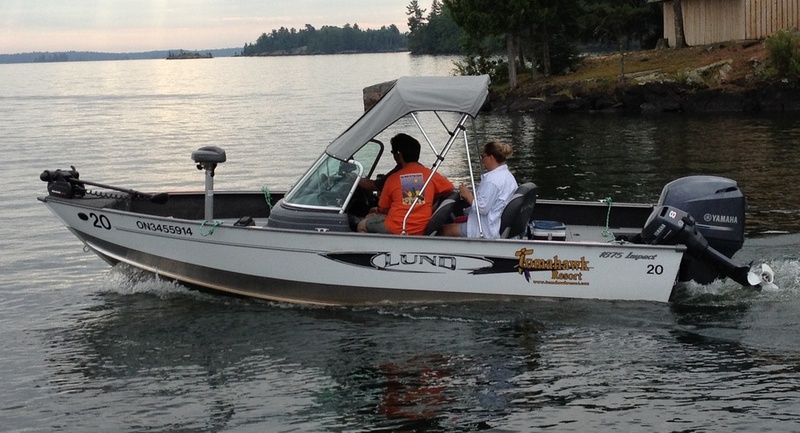 A small 16 round-bottom Lund boat with a 15 hp motor is also included, or guests may supply their own fishing boats to tow behind. Prices in US funds. Sales tax additional. Weekly rentals - Friday to Friday. 3 and 4 day rentals - Must either start or finish on a Friday.